Dictionary definition: “Latin American ice pop, usually made from fresh fruit.” In Mexico, Central and South America these are sold in little carts pushed by the “paletero” (ice pop salesman.) These ice boxes on wheels only fit around fifty “paletas,” a personal adventure. Leisurely, the paletero calls customers out of 90 degree homes during usually fierce warm weather of coastal cities (without seasons.) A simple, familiar, homespun, natural trade. Overtime “Paleterias”, unique shops selling paletas, have been recently attracting foreigners in touristic towns. The experience is quite different although still somewhat magical, as in the case of “La Paleteria” in Cartagena in the old walled city. A long line of customers stands between you and the paletas. 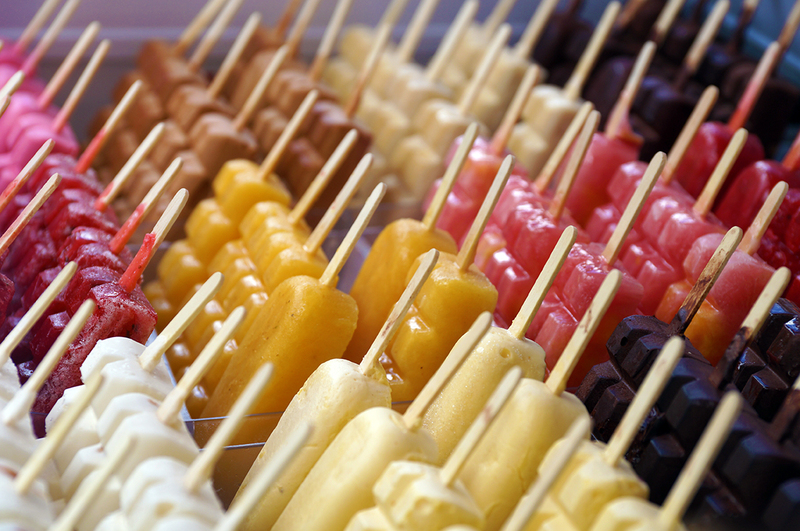 The bright colorful line of paletas stand neatly arranged bringing back childhood memories. Flavors are posted in the shop chalkboard: Coconut, mango, pineapple, lemon, papaya, tamarind, chocolate, vanilla, and many more. Finally the taste is absolutely refreshing and authentic. What a wonderful treat. Absolutely a must, if you are ever in Cartagena. Your food stories are awesome and fascinating! Thank you Annie, I’m glad!